Mrs Nicoletta Christodoulidou was granted her diploma in photography in 1982.After completing her studies she joined British Airways in 1984 at Larnaca Airport. Today, Nicoletta is an instructor at Airtravel Aviation Academy, Cyprus. Mrs Nicoletta Alkidou has received her Bachelor’s Degree in French Language and Literature from the National & Kapodistrian University of Athens, Greece. She is also a graduate in Language Teaching, Université Le Mirail, Toulouse, France. Subsequently, she obtained her MA in Management from the University of Wolverhampton, U.K. Her studies in three different countries enabled her to achieve educational diversity and at the same time, reach native-like fluency in English and French, in addition to her maternal Greek. She has been a Cabin Crew Member for five years with Cyprus Airways where she received extensive training on Airbus 310, 319, 320 and 330. In addition to this, her professional experience involves language teaching in both the public and private sectors, business management and entrepreneurship. Mrs Nicoletta Alkidou is an Air Cabin Crew Instructor , Airline Customer Service Instructor and Harvard Leadership & Management Instructor at Airtravel Aviation Academy, Cyprus. Mrs Maria Loizou was granted her diploma in Travel &Tourism at the college of tourism in 1990. She continued her studies for the IATA/UFTAA diploma at the college of tourism. After completing her studies, she joined Amathous Navigation Company in 1991 as a ticketing and reservation clerk for Olympic Airways, Air France and Scandinavia Airlines. In 1993 she joined Cyprus Airways for 20 years working at the ticketing reservation department until 2013. During her carrier in Cyprus Airways she received substantial trainings for sales&marketing, fare constructions, reservation system (SABRE) and Customer service. In 2015 she was employed for Swissport services at Paphos airport as a ticketing officer for Jet2 Airways. Since 2016 till present time she is manager for Gatr TravelMasters/Tour operators dealing with incoming tours from China. Today, Maria is an instructor at Airtravel Aviation Academy, Cyprus. ​​​Mrs Eliza Hadjipavlou was granted her diploma in Culinary Arts in 1997, and then continued her studies in Hotel and Catering Management at the Higher Hotel Institute of Cyprus from where she graduated in 2000. Her studies include Tourism and the Hospitality Industry, Safety, First Aid and Fire Prevention, Languages, Food and Beverage Service, Human Resources Management and Hospitality Law. She also received a certificate in Essential Food Hygiene from the Royal Society of Health, UK. After completing her studies, she joined the Hotel and Tourism industry where she received training and gained experience by working in various customer service related posts in 5 star hotels and travel companies. Her dream of becoming a cabin crew member was realized in 2002 when she proudly joined Cyprus Airways. For twelve productive years she put into work her vast training, knowledge and experience in hospitality as well as her attention to safety awareness, ensuring that all passengers received the best possible service and enjoyed a safe and comfortable flight..
​During her career she received substantial training in CRM , First Aid & Dangerous Goods. Her flying license includes A310, A319, A320 and A330. Eliza is married and has two young sons. Today, Eliza is an instructor in Airtravel Aviation Academy, Cyprus. Mrs. Yiota Aristidou upon completion her high school education has joined the College of Tourism & Hotel Management, where she graduated in 1990 and has been granted the Diploma in Hotel Operations. Her professional career includes employment in the Hotel and Hospitality industry where she worked for several years in 5 star hotels. Her vision however was to fly the world; this dream was realized back in 1991 when she joined Cyprus Airways as a cabin crew and then promoted to a Senior Cabin Crew . She stayed with the Airline for 24 years; essentially until the collapsing of Cyprus Airways. In June 2016 she joined Fly Orion as a Senior Cabin Crew. Mrs. Aristidou is an outgoing and sociable personality who enjoys sports, travelling, interacting on social media and meeting friends and colleagues for a cup of coffee and dining. Ο Αντώνης είναι μέλος του Institute of Certified Professional Managers των Ηνωμένων Πολιτειών. Είναι επικεφαλής επιθεωρητής ως προς το ISO 9001 και ISO 19011 και μέλος του διεθνούς οργανισμού Staregister. Εργάστηκε στις Κυπριακές Αερογραμμές για τριάντα χρόνια. Διετέλεσε εκπαιδευτής (εγκεκριμένος από το Τμήμα Πολιτικής Αεροπορίας της Κυπριακής Δημοκρατίας) και αξιολογητής του τμήματος πληρωμάτων καμπίνας των Κυπριακών Αερογραμμών από όπου έχει αποκτήσει μια τεράστια θεωρητική αλλά και πρακτική γνώση στους τομείς του Aviation, των Πρώτων Βοηθειών, Ασφάλειας και Υγείας και Customer Services. Ο Αντώνης είναι Πιστοποιημένος Εκπαιδευτής της ΑνΑΔ και Level 3 Award in Education and Training Ofqual UK.Είναι Εκπαιδευτής του Τμήματος Οδικών Μεταφορών για την εκπαίδευση επαγγελματιών οδηγών βαρέων Οχημάτων και Λεωφορείων στην Ασφάλεια και Υγεία και Πρώτες Βοήθειες. ​Ο Αντώνης είναι Διευθυντής του Κέντρου Επαγγελματικής Κατάρτισης A.S. Safety Partners Ltd που εδρεύει στην Λάρνακα. ​Τώρα ο κος. Αντώνης Σιαμαήλας, είναι εκπαιδευτής ιπτάμενου προσωπικού στην Airtravel Aviation Academy Cyprus. Michael Grispos has been involved in teaching/lecturing for the last 40 years and qualified as a teacher after obtaining his Bachelor of Education Degree from the University of Rhodesia in 1977. He taught in various private and government schools in Zimbabwe for 26 years of which 12 years were as a headmaster/principal. The political and economic turmoil in Zimbabwe led Mr Grispos and his family to leave for Cyprus in 2002. He obtained his MA (Tesol) from the University of Central Lancashire in 2012 which entitled him to teach English as a Foreign Language (EFL). The following year he was awarded a MA in Management from the University of Wolverhampton. ​These qualifications have allowed Mr Grispos to teach in colleges and language institutes. 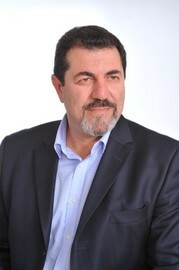 He was programme director at Global College in Nicosia and became a lecturer of English and Business subjects such Business English, Marketing, Advertising and sales Promotion and Consumer Behaviour. In addition Mike lectured BA students who were studying at the University of Wolverhampton and lectured a variety of subjects like Ent​repreneurial Creativity and Innovation, Leading and Managing in Organizations and Dynamics of Multinational Companies. During this period at Global College, Mr Grispos became a Cambridge Oral Examiner for Young Learners. 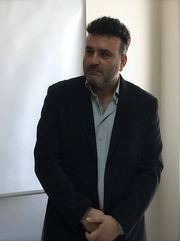 Michael has also lectured the Harvard Leadership and Management course at Air Travel Aviation Academy in Nicosia and at the present moment also lectures at the CTL Euro College in Limassol where his subjects are marketing, organizational change and public relations. ​Mr Grispos is married and has two sons George (32) who is a Computer Forensic researcher presently working in Ireland and Nicholas (29) who is a manager in a franchise company in Cyprus. Mr Grispos is instructor of Iata Leadership & Management - Harvard Business Publishing Diploma, at the Airtravel Aviation Academy Cyprus. ​Ο Νίκος Ιεροδιακόνου εργοδοτήθηκε από την Cyprus Airways το 1985 όπου παρέμεινε μέχρι τις 9 Ιανουαρίου 2015, ημερομηνία την οποία η Cyprus Airways έπαυσε να λειτουργεί. Υπηρετώντας σε διάφορες θέσεις τα τελευταία 15 χρόνια, ο Νίκος ήταν ο ένας εκ των δύο εκπαιδευτών του προσωπικού της Cyprus Airways και προσωπικό από διάφορες άλλες εταιρίες και οργανισμούς για τα θέματα των Dangerous Goods Regulations και Cargo. Η εμπλοκή του με το συγκεκριμένο εκπαιδευτικό αντικείμενο τον έκανε ειδικευμένο στο αντικείμενο αυτό. Η ειδικότητά του ενισχύεται από το γεγονός ότι συνέχισε κατάρτιση του σε αυτά τα ευαίσθητα θέματα των επικίνδυνων εμπορευμάτων για τις αεροπορικές μεταφορές και ήταν πάντα ενημερωμένος με όλες τις πληροφορίες σχετικά με τις συνεχείς αλλαγές, νέες νομοθεσίες και διεθνείς κανονισμούς που διέπουν τα ζητήματα αυτά. Ο Νίκος Ιεροδιακόνου στη μακρά σταδιοδρομία του στον τομέα της εκπαίδευσης και της κατάρτισης, απέκτησε πολλά διπλώματα και πιστοποιητικά από διεθνείς οργανισμούς, συμπεριλαμβανομένης της ΙΑΤΑ που ενισχύουν εκπαιδευτικές δεξιότητες, τις γνώσεις και την εμπειρία του από τη μετάδοση αυτής της γνώσης στους άλλους από το ευαίσθητο αυτό θέμα στον κλάδο των αερομεταφορών. Τώρα ο κ. Νίκος Ιεροδιακόνου, είναι εκπαιδευτής στην Airtravel Aviation Academy Cyprus.